It's been about three years since my last post on Howard Hughes Corporation (HHC) and I wanted to updated my mini-model and walk through some updated thoughts on their progress. Howard Hughes is a real estate company that is not a REIT and does not pay a dividend, also because of its mixed portfolio, doesn't screen well or fit into any easy to value bucket. Additionally, much of its value is in land and large assets that aren't currently producing any cash flow (for example, the Seaport). A counter to this, many REIT funds are including non-REIT real estate companies, for example, Vanguard's switched its mandate from a REIT fund to a real estate fund and included HHC in the process. Much has been written about the lack of new home construction since the financial crisis, one day this will normalize and HHC will be well positioned, their master planned community ("MPC") assets are highly sought after, providing the raw material homebuilders need and because of their maturity (hundreds of millions have been spent previously on infrastructure), feature high cash margins. HHC uses these cash flows to self fund commercial construction (office, multi-family, retail) in these MPCs that HHC holds for investment. NOI (and thus NAV) should continue to grow at a fast clip without needing to raise any equity capital, additionally the company has further growth levers it can pull via several under appreciated assets outside of their core markets that could have significant value. The easiest way to value the company is to run an net present value calculation on the land sales in the MPCs and the condo sales in Honolulu and add it to a NAV of the current operating properties and strategic developments minus any remaining construction costs and debt. The company publishes an undiscounted and unappreciated value of their land holdings in their 10-K, this is simply the average recent selling price of their land multiplied by the remaining acres, it doesn't account for the time value of money or any future appreciation in pricing as the remaining acreage should get more valuable over time as Howard Hughes builds out the amenities. I took those numbers and simple ran an NPV using a 10% discount rate assuming a straight line selling pace until the sell out date with no price appreciation built into it. Note: I just used book value for The Summit, which is an ultra-luxury community in Summerlin that's being developed with a JV partner, it's been a big success and likely worth more than book. In 2018, the MPC assets generated EBIT of ~$200MM, this roughly equates to a 10-11x EBIT multiple for the land business if you value it at $2.3B, which seems reasonable to me. Using roughly the same framework for the condo development business in Honolulu, ~$1300 square foot average selling price and costs of $1100/square foot and running an NPV using a 10% discount rate until the 2028 sell out date equates to about $833MM in remaining value. This doesn't account for the retail transformation that will happen over that time, just the condos, which the company has mentioned they'll be increasing their pace of tower construction as they have found a niche in smaller pre-furnished units in Oahu's highly supply constrained market. The company also provides a lot of detailed disclosure on their operating property and strategic developments segments making an NAV calculation fairly straight forward. Below, sorry its small, but I've taken each property, assigned a cap rate and deducted any property level mortgages or remaining construction costs on the unstabilized properties. HHC's office portfolio was heavily weighted towards Houston 2-3 years ago, they clearly made a mistake in overbuilding ahead of the oil rout in 2015 and several of the office assets in Houston remain unstabilized years later. However, since then they've been focusing office construction on Columbia, MD and in Las Vegas, most of these properties are new in the last three years. 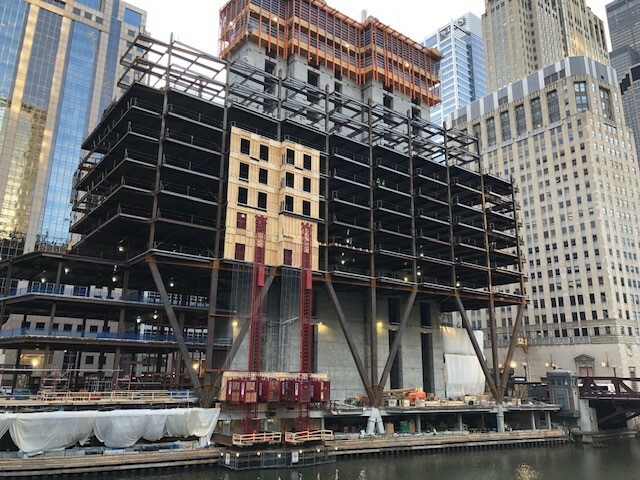 Another asset that didn't get much attention until recently is 110 N Wacker, it was a four or five story building that covered an entire city block along the Chicago river, it was previously the headquarters of GGP and was recently demolished. HHC along with JV partners (HHC owns 33% now, mostly just contributing their land) have commenced construction with a projected finish date in the back half of 2020. Bank of America will be the anchor tenant, leasing activity was brisk enough that two additional stories were added to the building to meet demand. It's a prime location on the river and near transportation, despite the building boom in the Loop, I can't imagine them having difficulty fully leasing the building upon completion. At that point, I'd expect them to sell their stake as it is non-core in that they don't control any properties or land around it, but anyway it's an asset that was an after thought in NAV models until recently, HHC has a couple others that could be even more significant that I'll touch on later. The biggest piece to the retail portfolio is the Seaport District located on the East River in Lower Manhattan, it was a tired yet popular tourist attraction until Superstorm Sandy destroyed it in 2012. Since then, Howard Hughes has been working on redeveloping the area, it has taken longer than originally expected and gone through a few strategic changes (notably switched from a "regular mall" to more of an experiential shopping experience). I don't like commenting too much on the Seaport's value as I'm not a New Yorker like many in the investment community who might have stronger opinions on the asset, but I mentioned in my year end post that a similar property in Chelsea Market was sold for over $2.4B. Chelsea Market is roughly twice the square footage as the Seaport, giving rough credit to the $1.25B value I'm putting on the Seaport before the remaining construction costs. HHC also bought a parking lot for $180MM near the Seaport that it plans to redevelop, likely into multi-family, as the Seaport stabilizes and increases demand around the neighborhood. They've heavily invested in multi-family properties in recent years, mostly successfully, less successfully on the hotel properties which are located in the Woodlands and were built right before the oil rout, similar to their office portfolio there, these properties have taken longer than anticipated to stabilize. These are the random other assets that Howard Hughes owns including the new AAA ballpark they built in Summerlin, a ground lease beneath the Vegas Golden Knights practice facility and the marina in Honolulu. Two of these other assets that I think are interesting and carried at little value on the balance sheet but could be significant drivers of NAV growth over the next 2-5 years are the Fashion Show air rights and Monarch City. HHC owns 80% of the air rights above the Fashion Show mall on the Las Vegas strip across the street from the Wynn and adjacent to Trump Tower on one side and TI on the other side. Back in 2017, there were rumors that the company was reaching out to design and construction firms for a potential casino resort development, but nothing more has really come of it and Las Vegas is in a mini-slowdown right now. The mall was owned by GGP, but Brookfield bought GGP last year and likely makes a more natural development partner for the project as Brookfield's stated strategy is to redevelop many of the acquired malls into mixed use properties. It may be another few years before anything happens here, but it's another potential driver of NAV that isn't included in my model or any that I've seen put out by analysts. Another under followed asset that HHC owns is 280 acres of land in Allen, TX on the corner of two highways that was recently renamed Monarch City and has plans for over 9 million square feet of mixed use development. To put that scale in perspective, HHC has 14 million square feet of entitlements (only a small fraction of which are currently built) in Downtown Columbia, but Monarch City is still large enough be a significant asset and potentially a 6th core market for HHC. Allen is an attractive market, it is a suburb north of Dallas and right in the heart of a big housing development corridor, fellow long time holding of mine Green Brick Partners (GRBK) is active in the area with several ongoing communities being built within a short drive of Monarch City. The Dallas metro area is very popular with corporate relocations given its low taxes, Howard Hughes is likely waiting for a big relocation opportunity to anchor the development before breaking ground or publicizing the asset further, if they're able to sign one, Monarch City is large enough to be a nice call option that's not currently factored into the stock price. Adding it all up, I get a reasonably conservative "today" price of HHC around $140 per share. HHC likes to point to their control of the markets they operate in and the reinvestment opportunities available to them within those tightly controlled locales. It potentially limits the risk of oversupplying a market (although they did that to themselves in Houston), plus it gives them an advantage when non-HHC owned assets come up for sale. They've recently purchased underperforming properties in The Woodlands and Columbia that they didn't previously own and have added them to their redevelopment pipeline, creates some synergies and continunity. Three years ago I got some feedback that Ward Village was unsustainable because of Chinese buyers, similar to the impacts Vancouver has seen, but HHC discloses the types of buyers in Ward Village and Chinese make up a low single digit percent, essentially a non-factor, most of the buyers are locals, Japanese and mainland second homes as you'd expect for that market. Mentioned this previously, but one thing I do like about Bill Ackman recruited senior management is he insists on skin in the game, with HHC, CEO David Weinreb put up $50MM out of his own pocket (one could argue he's rolling his previous warrant payday over, but I think the message is still the same) to buy a warrant package with a strike price at $124.64 expiring on 6/15/22. There's still plenty of time, but the stock price hasn't moved much despite all the activity over the last five years, I think management will do whatever they can to close the gap between the share price and their perceived NAV (which is much higher than mine) over the next 4 years. The CFO and COO are under similar incentive packages, but they put up significantly less money, $2MM and $1MM respectively. HHC has started publishing an AFFO metric, it was $5.41 for 2018, for approximately a 20x multiple which given the NOI growth path over the next 5-10 years seems cheap compared to many popular REITs. A similar company that I follow (but don't own) is Five Point Holdings (FPH), it's a developer of three master planned communities in California. It was created out of a partnership with Lennar (LEN) and is much earlier in its life cycle than HHC, but it has a similar plan to develop/sell lots to homebuilders and then build commercial development for investment once demand occurs. FPH is a broken IPO, trading about half its IPO price from a year or two ago, if anyone has thoughts on them I'd be grateful and interested to hear. OncoMed Pharmaceuticals (OMED) is the latest entry in my occasional series on busted biotechs, as the name suggests OncoMed is a development stage company focused on cancer related therapies, it hit a series of setbacks in 2018. It's now a micro-cap, just $40MM in market cap with $57.3MM in cash as of 12/31 (minus a significant burn rate) and few apparent prospects. In December, OncoMed announced a merger with U.K. based Mereo BioPharam Group (MPH), the deal is effectively structured as a reverse merger/cash infusion for Mereo resulting in the new combined company being dual listed in the U.S. and U.K thus opening up more channels for inevitable future capital raises. Mereo is focused on rare diseases, it has an interesting history of acquiring the "dogs and cats" of larger pharmaceutical companies that have received significant previous investment but for some reason or another are no longer strategic priorities. Mereo is technically public and trades on the smaller AIM exchange, but liquidity is extremely limited with just a few trades occurring over the past couple months. Mereo is going to create 23.7 million new MPH shares and through a depositary create Mereo ADRs that will trade in the U.S. to issue to OncoMed shareholders. The exchange ratio is subject to adjustment based on an expected OncoMed cash balance of $38MM at the time of the closing (guided to Q2), it can be adjusted both ways if the cash comes in above or below that line. At year end, cash was $57.3MM versus $70.9MM at 9/30, indicating about a $13.5MM quarterly burn rate putting that $38MM cash goal in jeopardy unless serious cost cutting as happened since the deal was announced. But using the 23.7 million shares number, current market prices (again, MPH barely trades, but is quoted at 160 pence) and current GBP:USD exchange rates equates to ~$50MM in stock consideration versus a market cap of $40MM for OncoMed. Celgene is OncoMed's historical development partner, however, they have declined to exercise several license agreements on OncoMed assets in the last 18 months, TIGIT is the last of those options and based on recent events seems unlikely to get exercised. NAVI doesn't have a commercialization partner (Celgene already turned it down), finding a new partner is step one before the CVR payment can be contemplated, in even the most optimistic scenario, receiving any payments is a long ways off. Additionally, earlier this month, OncoMed added a 3rd(!) CVR which seems a bit silly for a tiny micro-cap merger. However, it might signal that OncoMed is more optimistic that Celgene will opt-in to the TIGIT program than the market believes (okay, I'm probably stretching there), this new CVR will cover any additional payments received (other than the $35MM opt-in payment which would still be paid in MPH shares) from Celgene, so it only becomes a live bet after the opt-in occurs sometime in 2019 and diverts cash from NewCo to OMED shareholders. This CVR wasn't contemplated at the time of the merger, its likely a result of shareholder feedback and an effort to gain additional support for the merger. In summary, you have a potential ~25% upside from the arb spread closing (again, using stale/illiquid MPH market cap, I'm not underwriting to that number as it could drop significantly once there is liquidity but I've also had success from these reverse mergers going up after the deal closes) and the possibility of Celgene exercising their option on TIGIT which would add another ~90% return from the CVR before year end. This is obviously very speculative, I've sized my position small accordingly. KAR Auction Services (KAR) will soon be spinning off their salvage car auctions business, Insurance Auto Auctions (IAA), leaving the wholesale used car auction business and their floorplan financing unit at KAR. It's not entirely clear to me why this spin needs to happen, but the market is valuing the sum of the parts at a significant enough discount to each's standalone peer to make it an interesting spinoff to follow and see where the two pieces end up trading. ADESA ("Automotive Dealer Exchange Services of America") is the second largest provider of used car auctions in North America, with about 28%-30% of the market, behind industry leader Manheim, a subsidiary of privately held Cox Enterprises, that commands 42% market share. ADESA's auction sites link large volume car sellers (off-lease, rentals, repossessions, excess dealer inventory) with used car dealerships utilizing a consignment model where the company doesn't take ownership of the vehicles, but charges buyer/seller fees, transportation fees, and other fees that help prepare a car for sale (paint, small dent repair, detailing, etc.). Each car sold through ADESA represents about $600 in revenue. This is a reasonably good business, there are significant barriers to entry (for one it would be difficult to replicate their auction site footprint), low capital expenditures and limited working capital requirements, but it does feature some cyclicality to it via the supply and price of used cars. There are two big sources of used vehicles for ADESA: 1) cars going off-lease, as leasing has become a more popular option in recent years (although leveling off now) it provides ADESA with a strong tailwind as lessees turn their cars into the lessor, who then sells through an auction provider to used car dealers; 2) repossessions, on one call management described themselves as "Repo Kings" since KAR has an active repo business inside of ADESA, auto lenders are not natural sellers of cars on their own, so they sell to used car dealers through an auction provider. More people financing cars at greater and greater loan balances translates into more cars falling into default and repossession. AFC ("Automotive Finance Corporation") is the second piece of RemainCo, AFC provides "floorplan financing" to independent used car dealers to help facilitate sales at ADESA. Floorplan financing is a short term loan secured by the car that's paid back once the car is sold by the dealer. Because the loans are short term (65 days on average), 50% of the revenue ends up fee based generating mid-teens ROE and adding to the attractiveness of the business. Additionally, there are tens of thousands of independent dealers making this a difficult business to replicate at a nationwide scale and AFC's securitization financing provides a cheap competitive funding source. In 2017, KAR purchased the remaining 50% in TradeRev that it didn't already own, TradeRev is a dealer-to-dealer mobile app that facilitates real time auctions between dealers versus a traditional auction platform where the dealers are typically only on the buyer side. With the spin dividend cash from IAA, KAR will continue to invest heavily in TradeRev as they're in the midst of a nationwide dealer by dealer roll-out of the platform. Additionally, KAR has international ambitions and recently bought an online auction platform that serves much of Europe with stated desires to continue to pursue international acquisitions. IAA will be a standalone salvage auction business, when a car is totaled in an accident or has aged out of useability (think car donation charities) the car will be sold at a salvage auction for parts or scrap. Salvage auctions are similar to whole used car auctions in its transaction based ($500/car revenue, slightly lower due to fewer add-on services) where IAA doesn't take ownership of the car, however it's a more predictable business as cars will always need to be salvaged regardless of the economic cycle. Growing automotive car parc -- Industry speak for the total number of cars on the road, now just under 300 million, the average age of vehicles continues to rise, older cars getting into an accident are more likely to be a total loss. Increasing vehicle complexity leading to higher total loss frequency -- there are more electronic components and repair labor costs are rising making car repair more expensive, if the repair costs are more than the car is worth, it of course results in a total loss. Increasing accident frequency -- here they cite more cars on the road and more distracted driving (texting and driving, etc.). The stated reason to spinoff IAA is to create a standalone company that compares directly with their competitor Copart (CPRT). Copart maintains a similar ~40% salvage market share but has superior margins partially due to owning the real estate beneath their auction sites (IAA leases their sites), the rest of the margin difference is hard to parse out and might be an opportunity for improvement post-spin. IAA has been managed separately from KAR (different auctions sites, different customer bases, separate headquarters) and the soon to be CEO, John Kett, has been running IAA since 2014, eliminating some of the risk of IAA stumbling out of the gate that we often see with spinoffs. New KAR Auction Services doesn't have a direct North American public competitor since Manheim is privately owned by Cox Enterprises, but it does have a peer in the leading wholesale auction provider in the UK, BCA Marketplace PLC (BCA.LN). The combined KAR has $2.74B worth of debt and $345MM of cash, KAR is going to raise $1.3B of debt (not finalized) at IAA, sending $1.25B back to new KAR after gifting IAA with $50MM in cash, leaving new KAR with $1.145B in net debt. Management has been running this company as a separate unit, we should see some animal spirits unlocked now that their comp will be directly tied to the success or failure of IAA and the operating performance gap between IAA and CPRT will be on full display. I'm not worried about autonomous cars eliminating all accidents and thus total losses, or Americans giving up their cars entirely for ride sharing services, both of these risks seem far off into the future and may only capture a small niche in the end. I do worry that this thesis is too easy, KAR provides extensive and transparent segment reporting, investors should be able to see through the sum of the parts here? And I prefer when spinoffs have different shareholder bases, that's not the case here, but the business model interests me and given that the combined company trades below where both pure play peers trade, I think there's some margin of safety going into the spin, its worth keeping on your watch-list. SMTA's primary tenant, ShopKo Stores, filed for bankruptcy protection today and thus the reason for SMTA's existence is coming to an end. As a reminder, Spirit Capital Realty (SRC) spunoff their Shopko assets alongside their asset-backed securitization vehicle ("Master Trust A" or "Master Trust 2014") as SMTA in order to clean up the portfolio at SRC and make it comparable to peers in the triple-net lease space. SMTA's stated mission was to workout the ShopKo assets and other non-core properties and use the proceeds to fund more Master Trust notes. At the time of the Master Trust refinancing (end of 2017), the collateral value of the Master Trust assets was $2.596B, using the contractual rent number above, that's about a 6.8% cap rate, seems reasonable in today's environment, add in the restricted cash inside the securitization and the mortgage loans but leaving out the vacant properties nets us $690MM in equity value within the Master Trust. Let's exclude the Academy distribution center, workout/vacant assets, and the ShopKo term loan, but obviously include the cash, gets us to $792MM of asset value, subtracting out the termination payment to SRC and preferred to SRC gets an NAV of $13.70 per share. This number is highly sensitive to the cap rate used to value the Master Trust, at a 7.5% cap rate the NAV under the same methodology would drop below $9 per share. Who will buy SMTA? I think there's a wide range of buyers for the Master Trust (typical equity buyers in structured products: insurance companies, hedge funds, etc. ), but there is a new public REIT that's run by former SRC executives and pursues a similar ABS funding strategy, Essential Properties Realty Trust (EPRT) that would make sense as a buyer. I increased my position a bit first thing this morning, but still keeping it fairly small due to the leverage, plus SRC will be a beneficiary of any strategic transaction as it will further simplify SRC making clearly apparent its undervaluation compared to peers like O and NNN. 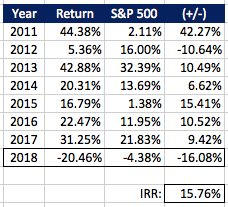 I'm ready to close the books on 2018, it was a difficult year for my personal account with a loss of -20.46% versus the S&P 500 at -4.38%. The only significant winner was the DVMT tracking stock, otherwise it was mostly all losers with the worst of them being Green Brick Partners, Caesars Entertainment and Wyndham Worldwide (pre and post split). Despite the poor results here, 2018 was a positive year both personally and professionally, thanks to everyone I've interacted with online and offline, Happy New Year. Here are some thoughts on each one of my holdings, I think most of them are especially undervalued if we avoid a recession in the near term (some of the prices might be stale as I wrote this over the last week). It all started with a nervous answer from Mark Frissora about hotel room demand in Las Vegas on an earnings conference call, but Caesars Entertainment has been cut in half in short order despite a few positive catalysts on the horizon: 1) the company is a rumored M&A target; 2) Mark Frissora, the much maligned CEO, is out as of 2/8/19; 3) legalization of sports betting rolling out nationwide, breathing fresh life into the company's regional casinos. In October, Tilman Fertitta's Landry's made an offer to merge with Caesars at a $13 per share valuation, obviously that's a bit suspect as its more a reverse merger and the $13 is only apples-to-apples depending on how privately held Landry's valuation is determined. But it showed interest/value in the mismanaged assets here, others have been rumored to be interested in Caesars although a deal might be too complicated to get to the finish line. I'd like to see them pursue former Pinnacle Entertainment CEO Anthony Sanfilippo in the meantime, focus on refreshing their portfolio and pursuing the remaining low hanging fruit capex projects, but wouldn't mind a takeout, although not counting on it. A word of warning, lots of leverage here via traditional debt (much of it floating) and their lease obligation with VICI Properties. LaQuinta Holdings (LQ) was a nice small win earlier this year as I initially sold the lodging REIT spinoff, CorePoint Lodging (CPLG), on the day it hit my account for ~$28 ($14 pre-reverse split) per share. I should have left it alone from there, but after CPLG's first quarterly earnings report came out and the stock traded down to about $20, I started buying and have been buying small amounts all the way down to where it trades today at $11.70 per share. Why has it fallen so sharply? I'm not entirely certain (which may be a red flag), 2018 results have been about in-line with what should have been expectations as the company recovers from the 2017 hurricanes and finishing up their repositioning efforts pointing to a strong 2019 recovery. What at first looked like management sandbagging due to incentives to keep the price "down" on the first day of trading (in hindsight, more than double the current price, they'll end up paying a lot more in taxes than they should have), now just looks like a management team that doesn't know how to properly tell their story to investors (a big issue when you're a REIT and rely on raising capital to grow). This is a strange asset for public markets, it has the second most rooms of any lodging REIT (behind industry behemoth Host Hotels (HST)) yet one of the smallest enterprise values. The market is valuing their rooms at ~$40k, versus ~$150k and above for some of their peers in the limited service hotel segment. It's trading at roughly 47% of fully depreciated book value, almost unheard of for an internally managed REIT with decent enough corporate governance. If we conservatively estimate EBITDA at $215MM next year and exclude any remaining tax payments to be received from Wyndham Hotels or insurance recoveries, CLPG is trading at just 7.8x EBITDA versus peers a couple turns higher. Again, this is a taxable spinoff without the two year safe harbor, if the share price doesn't turnaround quickly, I could see CPLG receiving pressure to put the company up for sale. We're up to 3 publicly unhappy shareholders (here, here and here) in "DFIN" (that's their new go-to-market brand to disassociate themselves from their former parent) as the market has grown impatient with their attempt to transition from a print based company to SaaS model. Despite the market volatility, transactional volume in financial markets appears to be strong, several big unicorns are scheduled to come public in 2019 which should be positive for DFIN going forward. Their top competitor in the print space, privately held Merrill Corp was sold in September, indicating there is an appetite for the declining side of the business. Probably doesn't mean anything, but DFIN's sister spinoff, LSC Communications (LKSD), announced it is being purchased by Quad Graphics (QUAD) shortly after its safe harbor expired. DFIN is trading at 5x EBITDA today and guided to being able to grow the topline low single digits over the next several years at their analyst day, if true, this business is trading too cheaply. In 2019, we could see the merger of GLIBA and LBRDA (maybe a spin of the TREE stake at the same time?) that could set the table for the inevitable but long awaited merger of Liberty's publicly traded Charter Communication stakes back into CHTR itself. The GCI piece of GCI Liberty received some bad news earlier this fall when the FCC decided to reduce a subsidy payment GCI receives for providing communication services to health care facilities in the Alaskan Bush, a $27.8MM reduction that has a similar cut to EBITDA. Much of the discount quoted for GCI Liberty assumes that GCI is worth what Liberty Ventures paid for it, however that might be a faulty assumption given Liberty Venture's need for an asset to complete their conversion away from the tracking stock structure (reasonably makes sense to have overpaid) and this news from the FCC. But I continue to hold, Charter should have a good 2019 from a FCF standpoint as the merger integration of Time Warner Cable and Bright House Networks is completed and the capex spending subsides paving the away for more buyback activity. Even Dallas, Green Brick's home market, is now showing significant signs of a slowing housing market after years of growth, however GRBK's earnings are up 62% year-over-year, but that doesn't matter at the moment and the stock is down 37% year-to-date. Green Brick is responding by pivoting to building more entry level homes in the Dallas area as millennials continue to move out of the basement and start families, but interest rates and student loan debt are impacting affordability. The NOL is essentially gone opening up some M&A possibilities (no Section 382 restrictions), it is now David Einhorn's 3rd largest position (when formed GRBK was a rounding error for Greenlight Capital) and it trades for about 7x fully taxed trailing earnings or 80% of book value. If the housing market is in for more of a pause than a true downturn like the previous cycle, then GRBK should do quite well from here. We'll know more about Hamilton Beach's progress after their 4th quarter earnings release, but HBB is one of those cases where a poorly performing business (in this case, retail chain Kitchen Collection) is masking the true profitability of the core small appliance business. HBB as a whole is trading at 14-15x trailing net income, but if they could full extract themselves from the Kitchen Collection business, the core small appliances segment is trading at more like 11x trailing earnings which they expect to "increase substantially" in 2018 over 2017. HBB has been actively managing Kitchen Collection's leases to the point where all their leases will soon be a year or less in term (essentially pop up stores) and they'll be able to reduce their fixed costs and get their losses under control. There are some legitimate concerns about Amazon Basics/Alexa empowered devices entering this market, plus this is a family controlled company, so I'm not convinced HBB is an immediate take out target after their two year safe harbor period expires in September, but HBB is cheap enough to overcome these risks and if management executes on their long term growth plan it could be a significant long term winner. The slowdown in housing has hit Howard Hughes (WSJ reported on a Las Vegas slow down recently), its stock price is down over the last several years and it once again appears really cheap (similar to early 2016 when the oil downturn really hit Houston) at $95 per share. HHC's net asset value is a bit abstract (I'd peg it at about $150-170) but it has almost certainly grown over the years and should continue to grow into the future as their assets mature. The Seaport should begin to show its worth in 2019, I'd expect HHC to do some kind of transaction to monetize the asset, perhaps sell 49% to a partner in order to mark the asset for investors (e.g., Chelsea Market was bought by Google for $2.4B) and de-risk their asset concentration. Management here is also incentivized to get the stock price moving, CEO David Weinreb put up $50MM of cash out of his own pocket to buy warrants exercisable at $124.64 per share on 6/15/22, or 30% higher than where it trades today. KLXE has gone on a wild ride since their spinoff from KLXI as oil prices took another leg lower threatening their business if O&G exploration companies back off their drilling plans. Management here also abandoned their debt free balance sheet which initially appealed to me and levered up with $250MM of expensive 11.5% coupon debt in order to make an acquisition (reminder, same management built their energy business in 2013-2014 through a series of untimely deals before the bottom fell out in oil). But I still like the incentives at play, management is taking their salaries in shares, its a taxable spinoff, KLXE has tax attributes that should shield much of their income, and they've guided to $190MM in 2019 EBITDA. That puts their current multiple a bit above 3x, now that's somewhat misleading as another deal must be in the works, you don't raise 11.5% debt and only put half of it to work, but either way KLXE is exceptionally cheap if results pan out. I've received a lot of feedback from people smarter than me in the energy space (low hurdle) that this is a bad business, people don't like their assets, it's a tourist trap for event-driven investors, etc., as a result I'm continuing to keep this one a small piece of my portfolio. The perennial wait until next year stock, Liberty Latin America looks cheap at just ~7 EV/EBITDA with much of the hurricane recovery/noise behind them in Puerto Rico and FCF hopefully inflecting positive. The story here generally remains the same as its always been, cable in the Caribbean/Latin America is under-penetrated along with a fragmented market featuring sub scale operators, while incomes are growing and the middle class is expanding. Will 2019 be the year LILAK stops becoming a running joke and actually starts to work? Let's hope so. At the beginning of the year, MMA Capital announced the sale of their management company and some other assets to Hunt with the publicly traded shares becoming an externally managed vehicle focused on ESG debt investments that resembles a BDC. The remainder of the year was spent finalizing the transformational transaction and cleaning up the portfolio to free up additional capital to make additional solar energy loans. Additionally, the company recently won shareholder approval to change their corporate structure from an LLC to a C-Corp which should make it eligible for index inclusion next year (a positive of not being a BDC as they're generally excluded from index funds). I would also suggest a name change is in order, since the "capital management" company was sold and they are moving away from the tax credit business (MMA was the stock symbol under old the MuniMae name), something that signals green or ESG and less cage fighting is probably better to market the shares. Either way, shares remain cheap at $25.25 when book value is approximately $35, the company and management themselves continue to buyback stock as well. Par Pacific's stock performance has been a head scratcher for me in recent months, it closed on a game changing acquisition of the only other refinery in Hawaii, an isolated market, for pennies on the dollar because they were the only available buyer for the asset. Shortly after announcing the Hawaii deal they announced the acquisition of another refinery and related logistical assets in Washington state that would link their current two markets (Hawaii and Wyoming) together and provide additional opportunities for bolt on M&A going forward. All while they've maintained profitability for many quarters in row now, seemingly hitting an inflection point in their roll-up strategy and have signaled to the market that their $1.4B NOL will finally be put to good use once the dust settles, yet it's trading at near multi-year lows. Perspecta seems to be a recent victim of the government shutdown and could be an excellent opportunity for an investor looking to buy a cheap stock in an industry relatively insulated from the general economy. PRSP is currently trading for 7.5x EBITDA, peers trade for 9-11x, the one risk most investors focus on is their largest contract ("NGEN") is being split in two by the U.S. Navy, management on the most recent earnings call mentioned they expect the services side of the contract will be as large as the current contract is today. That reassurance plus general growth in government budgets should provide a floor to Perspecta's business as it moves forward as an independent business in an increasingly consolidating industry. It looks like Shopko is going to file bankruptcy in the near future, possibly soon after the books officially close on the holiday season. In November, SMTA took out $165MM in non-recourse financing against the previous unencumbered Shopko properties to "put a floor" under the valuation which looks smart now and they must have known something was in the works (their $35MM B-2 term loan will likely be worthless, but one rationale for providing that financing was to receive timely financials). In their spinoff investor presentation, they laid out a $12.80 per share "NAV" for the MTA equity minus the preferred share that's likely still close to reality given where the other net lease REITs have traded in the meantime. If Shopko is going to liquidate and the boxes SMTA owns end up being turned over to the lucky new lender, the reason for SMTA existing will be gone. SMTA will owe a termination fee of ~$1.80+ per share if things are wrapped up within 18 months of the spin, but SMTA also has ~$2.40 per share in unrestricted cash after the special dividend. There's potentially a fair amount of upside on a stock that trades around $7.25 today even in a Shopko bankruptcy scenario. The parent and external manager of SMTA, Spirit Realty Capital (SRC), is now a vanilla triple net lease REIT primarily focused on single tenant retail properties. Its portfolio looks very similar to peers like Realty Income (O), National Retail Properties (NNN) and STORE Capital Corp (STOR), its valuation however does not, SRC trades for just under 10x FFO, while those other three trade for 15-19x FFO. SRC is less than half the size of the smallest of those (STOR), it might make sense for one of them scoop up SRC at a nice discount using their own shares as a currency. If it decides to go it alone, at 13x FFO, it's a $47 stock, 35% upside compared to where it trades today around $35 (FYI -- SRC recently did a reverse split). What a roller coaster year for the timeshare industry, at one point all these stocks traded for 10-12x EBITDA, now its more like 6-7x EBITDA, amazing what a shift in market sentiment can do to an incredibly economically sensitive sector. We always fight the last recession, but timeshares have remodeled their business to where they look less like a real estate developer and more like a hotel management company. I expect these businesses to do better through the next recession, but the stocks will likely get hammered anyway. I did some trading around my WYND position, bought some LEAPs and then sold my shares at a loss 31 days later to tax loss harvest. If sentiment improves, shares could move up 50% if EBITDA multiples return to 8-9x for the sector, seems like a good bet if we avoid recession. Wyndham Hotels is the steadier business of the two Wyndhams, it features more of a franchise model compared to a franchise and management model of their larger peers like Marriott (MAR) and Hilton (HLT). In the franchise model they take a percentage of revenue, in the management model it's a combination of revenue and operating profit, thus the franchise model should be more resilient to changes in economic conditions. 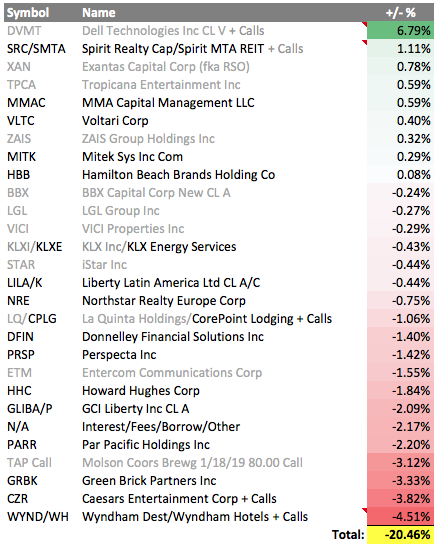 WH trades for under 10x EBITDA when it's closest peer in Choice Hotels (CHH) trades for 12.5x. Mitek Systems (MITK), Northstar Realty Europe (NRE) and Voltari Corporation (VLTC) are all new additions and not much has changed since their original posts. BBX Capital (BBX): I rushed into this one without fully appreciating how awful management has been, the BXG IPO was also a signal the timeshare multiples were at their peak. I sold to free up some capital for other ideas, good timing, as the stock went a lot lower, but so did the rest of my portfolio. An activist is now having fun with Levan and team over at www.bbxfacts.com, worth a read if you haven't seen it yet. Dell Technologies Class V (DVMT): Enough ink has been spilled about Dell's unfair treatment of the tracking stock in Dell's recently completed Class V Transaction. It was by far my biggest winner of the year, but still left a bad taste in my mouth of what could have been if Michael Dell had any integrity at all. DELL shares might be cheap, but I have enough exposure to overly leveraged companies elsewhere in my portfolio, I closed out a few weeks prior to the deal closing. iStar (STAR): Someone asked me about iStar in my NRE post, but to summarize here, I've soured a bit on the company, might come back to it at some point as it is extremely undervalued on an asset basis but hard to know when or how that asset value gets realized with the current management. Also a bit concerning here is the commercial real estate finance book, much of it is construction and development loans to hotel/condo developers in formerly hot coastal markets like New York City and Miami. A better way to own similar cheap exposure to the net lease and land development without the CRE loan book might be to barbell something like SRC and HHC together, both have managements I trust a lot more than iStar. Tropicana Entertainment (TPCA): The deal with Eldorado Resort (ERI) and GLPI closed on 10/1, Icahn ended buying the Aruba property himself limiting the upside on the "uncertain amount" aspect to this merger arb, hard to say if he gave us a fair shake or not, but guessing not. Either way, it worked out well and closed a couple months sooner than initially expected. Disclosure: Table above is my blog/hobby portfolio, I don't management outside money, its a taxable account, and only a portion of my overall assets. The use of margin debt, options, concentration doesn't fully represent my risk tolerance. Voltari Corp (VLTC) is a tiny nano-cap (~$5MM today) and not actionable for many people, but it was once a mobile internet advertising company that pivoted to a triple net lease real estate strategy in 2015 after a rights offering where Carl Icahn gained control of the company. Why was Icahn interested in the company? They had somehow managed to rack up almost $500MM in federal NOLs and several hundred million in state NOLs. Entities controlled by Icahn own 52.7% of the common stock and 98% of the preferred stock. That preferred stock accrues interest at 14% (13% prior to 1/1/18) and has been paid-in-kind since inception, today the redemption value has grown to over $65MM, essentially wiping out the common equity over the last 3+ years. Additionally, an Icahn entity is the lender on a $23MM revolving note used to finance the company's triple-net acquisitions, which there have only been three: 1) JPM Chase branch in Long Branch, NJ; 2) a 7-Eleven store in Flanders, NY; 3) and a more sizable office building leased to McClatchy in Columbia, SC. One could say he's been slowly squeezing the value out of the company for several years and on 12/7, he delivered the final blow to equity holders, offering to buy the remaining 47.3% of the company he doesn't own for $0.58 per share or for a total of about $2.5MM. For that $2.5MM, he'll presumably gain sole access to the NOL and can start putting it to real use ( VLTC hasn't generated taxable income since Icahn gained control). I'm far from a tax expert, but I'm guessing either his preferred stock or the passage of the 3 year look back is enabling this move without busting the NOL. He has a history of doing this sort of thing, Cadus Corporation (KDUS) was another Icahn controlled nano-cap where he bought a dozen or so luxury homes in south Florida into an NOL shell, it generated no revenue during this period and Icahn offered to take out the equity for $1.30 per share prior to the first property sale, eventually bumping it twice to the final takeout of $1.61 per share. We could see a similar bump with VLTC, what's a few hundred thousand more to secure access to a $500MM NOL? But I'm also not counting on it, there are only 4 board members, 2 of which are affiliated with Icahn including the Chairman, although he's somehow considered independent despite being on many Icahn controlled boards and owns zero shares -- there are no friends to minority shareholders here to provide much resistance. Also, the equity (placing no value on the NOL) isn't worth anything after deducting the revolver and preferred stock. Despite all that, given Icahn's history and recent moves to clean up his empire, I think the offer will at least hold with a slight chance of a bump to secure it getting done. Today it trades for $0.50 per share, offering an absolute return of 16% over 6-9 months it'll take to complete. Mitek Systems (MITK) is a small software company that a decade ago invented the image capture technology enabling check deposit now embedded in almost every bank's mobile app. The product is loved by both banks and their consumers, for banks it is much cheaper to process a mobile deposit than to maintain the ATM/branch infrastructure and for consumers they can make a deposit instantaneously from anywhere without needing to stand in line. While growing -- Mobile Deposit is 65-70% of Mitek's business -- mobile check deposits only make up a small percentage of the overall number of bank transactions, however paper checks continue to decline in use and Mitek needed a second act for its image capture technology. They turned to mobile identification verfication; to open a bank account in the U.S., banks need to complete a series of steps to "Know Your Customer" (KYC) and that includes getting a government ID. If banks or other regulated entities want to source customers through their mobile app, they need a way to verify their identity, opening up another growth path for Mitek. The user takes a picture of their government issued ID and a selfie, Mitek's software compares to the two to confirm a match and also ensures the government ID is valid. It's an interesting business and a nice little growth story, but what makes it especially interesting is Elliott Management (via a portfolio company called ASG Technologies) has made a hostile bid for the company, first at $10/share and now at $11.50/share in cash, MITK trades a touch over $10 today. Elliott is of course a famous large activist investor known for getting their way, I personally recall how quickly American Capital (ACAS) changed course and folded to their demands a couple years ago before being pushed into the hands of a strategic buyer. Mitek is a much smaller company at ~$370MM market cap, no debt, and no controlling shareholder. Until recently, the company didn't have a CEO or a CFO, presumably that's when Elliott smelled blood and made their initial bid for the company. Prior to the bid becoming public, but after it was made privately, Mitek did a strange thing and established a shareholder rights plan to protect the NOL, despite the NOL being only $27MM and thus insignificant to the value of the company. More likely they were trying to prevent Elliott from acquiring a significant stake in the company in order to buy time and possibly end up in the arms of someone of their own choosing. Mitek issued a statement regarding the most recent $11.50 offer, in it they disclosed that "other parties have expressed interest in Mitek" and also disclosed that Elliott is looking to replace the board with its own slate of directors. With the shareholder base turning over quickly to arbs and others sympathic to Elliott, management is likely overmatched here. At current prices you have low teens upside to Elliott/ASG's $11.50 offer, with the potential for more if the board is able to squeeze out a third bid from Elliott or able to quickly find a white knight strategic partner willing to pay an even higher premium. If not, the stock probably falls temporarily but with the growing business providing some downside protection as mobile deposits continues to grow and identity verification gains traction.